The above info came from Mujihi na Tenshi, and was edited by yours truly (contact me). 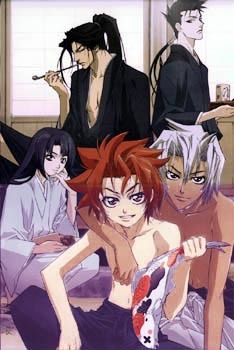 The image came from Peace Maker Kurogane. Peacemaker Kurogane mostly centers on a 15 year old boy named Tetsunosuke Ichimura, who wants to join the Shinsengumi to avenge the death of his parents. His older brother, Tatsunosuke, cares for him like a father, and also works for the Shinsengumi, albeit as an accountant. In the first episode, Tetsu tries to join the Shinsengumi but is refused. He sits by the river with Tatsu, when a pig, Saizu, runs into him and knocks him into the river. The pig's pet, a very cute young man, apologizes and invites the brothers in for tea. The young man realizes Tetsu wants to join the Shinsengumi and says he knows people there, and will put in a good word. They go to the Shinsengumi dojo, where the leader, Kondo Isami, agrees to let Tetsu fight the legendary Captain of the First Squad, Souji Okita...who turns out to be, much to the amazement of the brothers, the cute kind young man who invited them in for tea (and who's pig knocked Tetsu into the river). Okita and Tetsu's fight is stopped by Hijikata (the second-in-command), who disapproves of the fight and of Tetsu's request to join. Tetsu stays in the rain outside the dojo all night to prove he wants to join. Okita finally manages to convince Hijikata to allow him to join...what Tetsu doesn't know is that he joins not as a soldier, but as Hijikata's page! The following episodes deal with Okita teaching Tetsu the ropes...and how, to join the Shinsengumi, you must become a demon. The above description came from Mujihi na Tenshi, and was edited by yours truly (contact me).